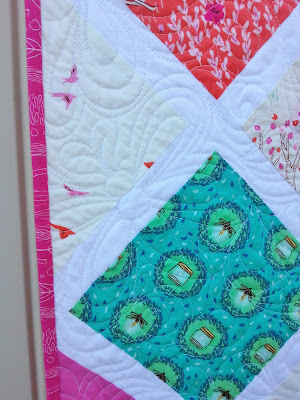 Today I'm super excited to show you my latest quilty finish. 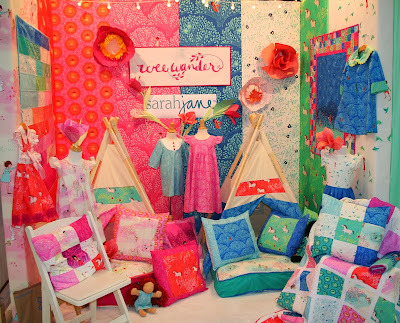 Last month I was able to work with the lovely Sarah Wright of Sarah Jane Studios as she prepared for quilt market. 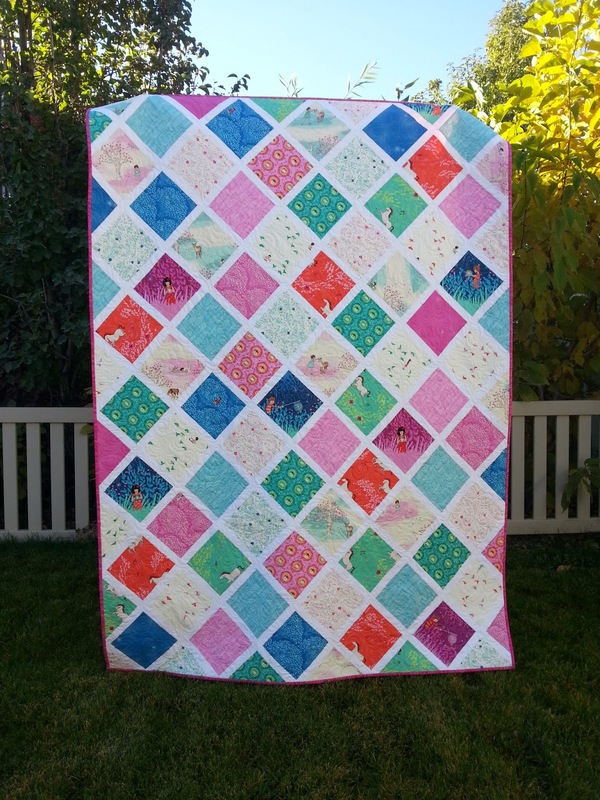 I made a quilt for her booth out of her new Wee Wander line that will be hitting stores in January. If you are a fan of Sarah's work, like I am, you will definitely love her new line! Here is a look at her full market booth. As for the quilt, this was my first time working on a market project and my first time dealing with the crazy slim market sew time lines, but it was a lot of fun! I had cleared my schedule in anticipation of the fast turn around time so I could devote my days to getting the quilt done. I thought I'd have 10 days to sew, but I ended up only having 5!! It was crazy, but like I said, I really did have fun! Sarah and I decided on a simple design that would show off her fabrics beautifully. Sometimes the simplest of designs is the prettiest, don't you think? A bunch of Sarah's fabrics incorporate fireflies into the design so my quilter was awesome and quilted fireflies all over the quilt. They look so dang cute, don't you think? 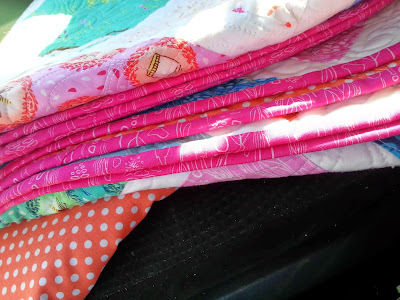 I was literally snapping photos right before handing over the quilt (which is why they are not the greatest...) so you can head over to Sarah's blog to see lots more. She posted close up/detail pics of her fabrics, as well. And finally...One last booth photo for good measure! It was fun to work with Sarah and fun to have a project at market! Good for you! The quilt looks really good. Very pretty and love those dragonflies. 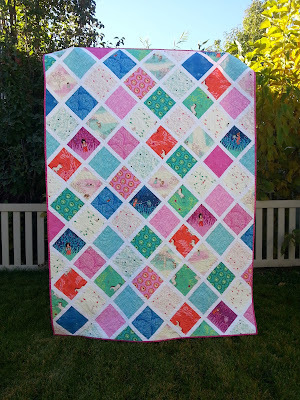 i really need to get some of those horsies;) Beautiful quilt!! Sarah Jane is my favorite designer and this line is my new favorite! (Sorry "Children at Play.") You did a BEAUTIFUL job on this quilt! I agree: if the fabric is great, then leave the quilt design simple. And Fireflies as the quilting? Genius! I can't wait to get my hands on this fabric, too! How fun to get to sew a quilt for the booth for Quilt Market! How do you get involved with opportunities like that? 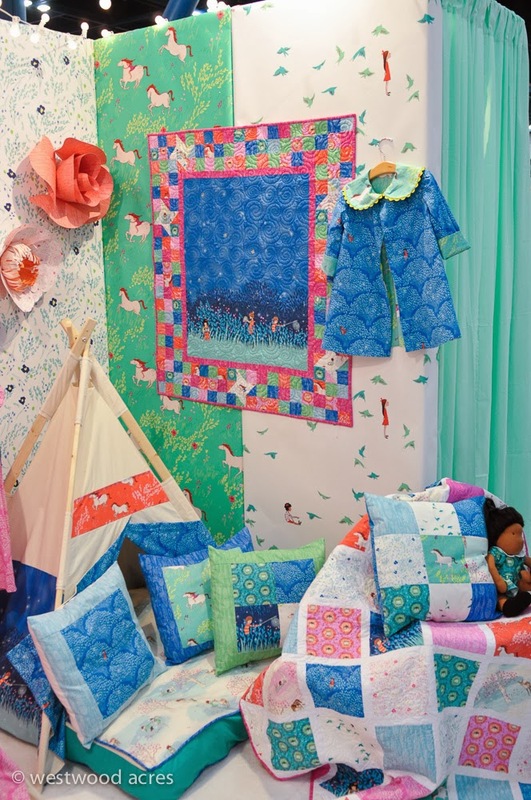 I love that the simple pattern really highlights the fabrics and the quilting of the fireflies is awesome! Sweet quilt! Sounds as though you were under a bit of pressure to get it finished in time for market. How nice to have something you made for it. 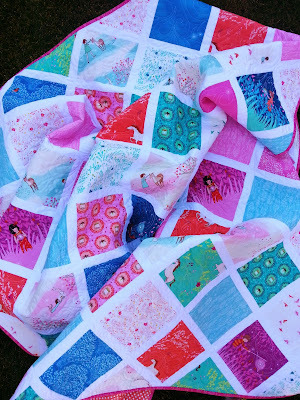 I don't suppose you have the pattern for this gorgeous quilt? I just stumbled on it and am in love!!! I would love to make it for my daughter.